Principals, teachers, and school administrators can use this printable school adjustment letter to respond to parent and student complaints. 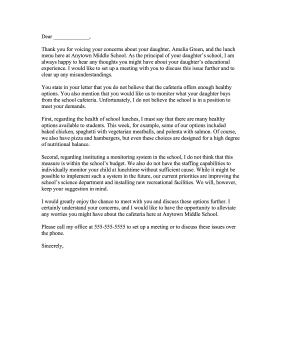 Thank you for voicing your concerns about your daughter, Amelia Green, and the lunch menu here at Anytown Middle School. As the principal of your daughter's school, I am always happy to hear any thoughts you might have about your daughter's educational experience. I would like to set up a meeting with you to discuss this issue further and to clear up any misunderstandings. You state in your letter that you do not believe that the cafeteria offers enough healthy options. You also mention that you would like us to monitor what your daughter buys from the school cafeteria. Unfortunately, I do not believe the school is in a position to meet your demands. First, regarding the health of school lunches, I must say that there are many healthy options available to students. This week, for example, some of our options included baked chicken, spaghetti with vegetarian meatballs, and polenta with salmon. Of course, we also have pizza and hamburgers, but even these choices are designed for a high degree of nutritional balance. Second, regarding instituting a monitoring system in the school, I do not think that this measure is within the school's budget. We also do not have the staffing capabilities to individually monitor your child at lunchtime without sufficient cause. While it might be possible to implement such a system in the future, our current priorities are improving the school's science department and installing new recreational facilities. We will, however, keep your suggestion in mind. I would greatly enjoy the chance to meet with you and discuss these options further. I certainly understand your concerns, and I would like to have the opportunity to alleviate any worries you might have about the cafeteria here at Anytown Middle School. Please call my office at 555-555-5555 to set up a meeting or to discuss these issues over the phone.